Broad Street runs north – south from Broughton Street in the south to Pandora Avenue at Victoria City Hall in the north. It is interrupted between Fort Street and View Street by The Bay Centre. This building at 1005-1009 Broad Street and 636 Broughton Street – at the corner of Broad Street and Broughton Street – was built in 1884 by architect Thomas Trounce for John Weiler, who used it as a warehouse, showroom and manufacturing facility for his furniture business. This building was listed on the Canadian Register of Historic Places in 1994. The Weiler Building at 1005-1009 Broad Street and 636 Broughton Street was built as a furniture factory and warehouse for John Weiler in 1884. The Fell Building was built in 1879 for James Fell. The Central Building, 620 View Street, built in 1911-1912 by architect Jesse M. Warren. The Central Building is listed on the Canadian Register of Historic Places. 630 Yates Street, built in 1950 by architect William F. Gardiner for the Bank of Toronto, whose logo is still visible above the main doorway. 630 Yates Street was built in 1950 by architect William F. Gardiner (1884-1951) for the Bank of Toronto, which used it as its main downtown Victoria branch office. The Bank of Toronto logo is still visible above the main door. This building was listed on the Canadian Register of Historic Places in 2008. 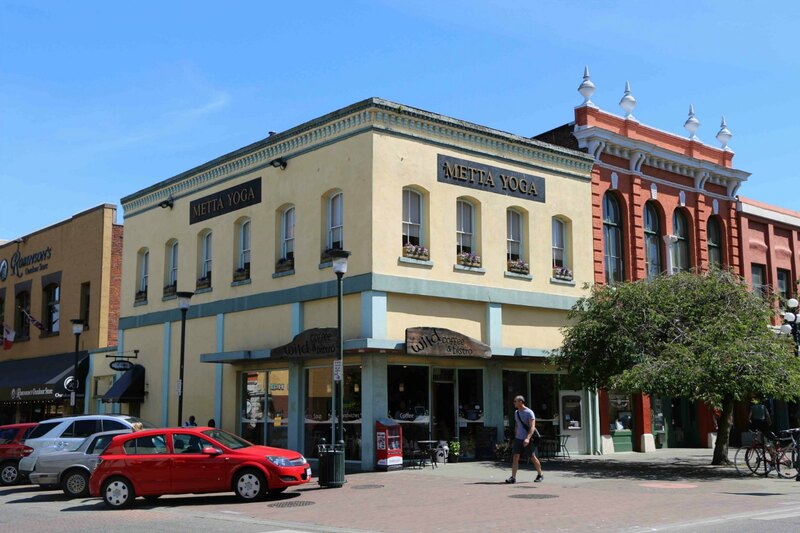 This building is currently the Legacy Art Gallery, operated by the University of Victoria, which uses the building as an art gallery as well as renting it out for special events. This Heritage Registry building was built in 1909 by architect David C. Frame for the Victoria Creamery Company. Since 1948 it has been occupied by Robinson’s Outdoor Store. The Duck’s Building was built in 1892 by architect William Tuff Whiteway for Simeon Duck (1843-1905) who used the main floor for his carriage making business while renting out space on the upper floors. 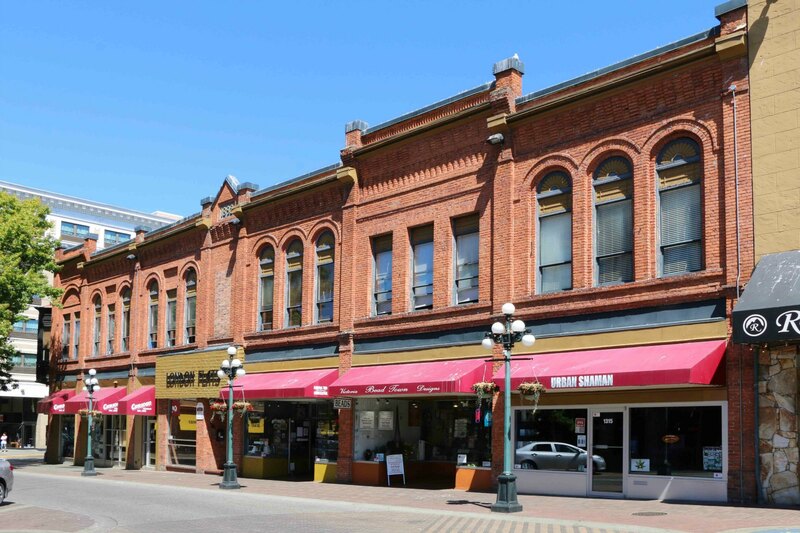 This building is on City of Victoria Heritage Register and is an excellent example of a late 19th century downtown Victoria commercial building. The Duck’s Building was listed on the Canadian Register of Historic Places in 1995. This building at 615-625 Johnson Street and 1330 Broad Street was originally built in 1874 by Simeon Duck as the Canada Hotel. This building was listed on the Canadian Register of Historic Places in 2005. 642 Johnson Street, at the intersection of Broad Street and Johnson Street, is now the Carlton Plaza Hotel. It was originally built in 1912 as the St. James Hotel by architects Emanuel J. Breseman and M. Eugene Durfee for Charles Hayward, a former Mayor of Victoria. Carlton Plaza Hotel, 642 Johnson Street. 1981 addition. 618-624 Johnson Street/1400-1402 Broad Street, built in 1909 by architects Thomas Hooper and C. Elwood Watkins for Lee Cheong, Lee Woy and Lee Yan Yow. This commercial building at 618-624 Johnson Street and 1400-1402 Broad Street was built in 1909 by architects Thomas Hooper and C. Elwood Watkins for Lee Cheong, Lee Woy and Lee Yan Yow, three prominent real estate investors from Victoria’s Chinese community. The main occupant is Island Collateral & Sales, Victoria’s oldest pawnshop, which has been in this building since 1970. This building was built in 1906 by John Meston for his carriage repair and blacksmithing business. John Meston’s Carriage Factory had been on this site since 1889 and this building replaced an earlier structure used by Meston’s Carriage Factory. The building is now used for parking. It is listed on the City of Victoria Heritage Register. 1407-1411 Broad Street. Originally built by John Meston for his carriage making and blacksmith business. 1408-1410 Broad Street was built in 1910 by architect William Ridgway Wilson. It is listed on the Canadian Register of Historic Places. Built in 1909 by John Meston, who also owned the adjacent building at 1407-1411 Broad Street. 1417 Board Street. Built in 1909 by John Meston, who also owned the adjacent building at 1407-1411 Braod Street. This building at 1420 Broad Street was built in 1907 by architect Francis Rattenbury as an office and warehouse for the Brackman-Ker Milling Company. It is currently a broadcasting facility owned by Rogers Communications, which houses Victoria’s CTV affiliate, CIVI, and radio stations KOOL-FM (107.3 FM) and C-FAX 1070 (1070 AM). The building is listed on the Canadian Register of Historic Places. Broad Street terminates to the north at Pandora Avenue facing the Victoria City Hall Annex.